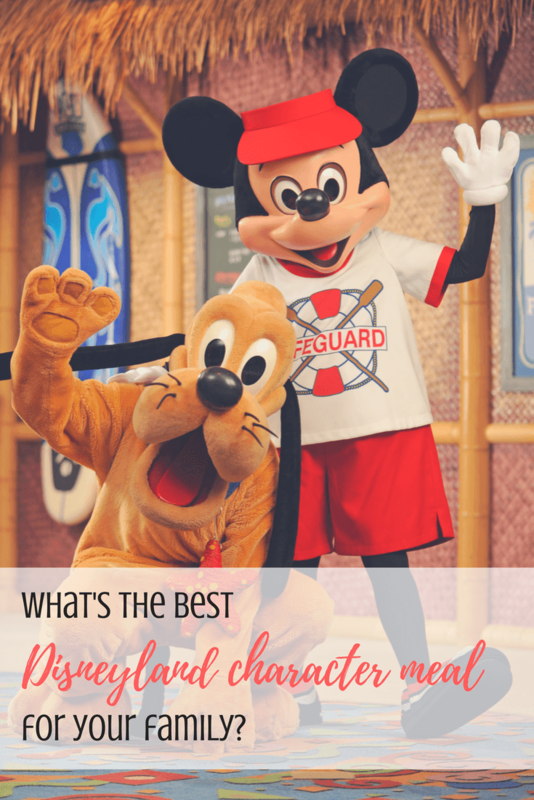 Disneyland Character Meals ~ Which One Is Best for You? Each Disneyland character meal has its own feel, special touches, and star character. These five character dining options offer a great way to meet many characters in one fell swoop. This frees up park time to enjoy rides, shows, and other attractions rather than waiting in long lines for a brief photo opportunity. But how do you know which Disneyland character meal is best for your family? I break it down for you below. Where? The Plaza Inn inside Disneyland (so you must have a Disneyland park entrance ticket to dine here). Characters? We saw a multitude of characters at this meal, from Minnie herself to Cinderella’s Fairy Godmother. The Verdict? This Disneyland character meal breakfast buffet features will made-to-order omelets, pastries, Mickey-shaped waffles, and other tasty treats. Dining with Minnie with a view of Tomorrowland’s Asto Orbitor was a wonderful start to our day at Disneyland. However, I’d rather not “waste” precious park time eating a long breakfast. I suggest eating a character meal at one of the hotels either on the day of arrival or departure to squeeze in some extra Disney magic on a day when you don’t want to spend your money or time at the parks. Tips? Be sure to request a seat indoors when you make your reservation and again when you check in so you can get out of the heat or the cold, as the case may be. The pink stained glass mosaics inside are darling, plus you will feel more a part of the action. Read reviews of Plaza Inn on TripAdvisor. Where? Storyteller’s Café at Disney’s Grand Californian Hotel. Characters? Chip n’ Dale and other woodland characters like Brother Bear and Winnie the Pooh. The Verdict? This is the best Disneyland character meal for unusual autographs. Children who have their hearts set on seeing a specific character may be a tad disappointed to be greeted by the array of woodsy creatures here. On the other hand, kids collecting signatures might be pleased to find some off-the-beaten-path characters to sign their autograph books! Read reviews of Storyteller Cafe on TripAdvisor. Where? Goofy’s Kitchen at the Disneyland Hotel. Meals offered? Brunch and dinner. Characters? The only character guaranteed to make an appearance at any meal is the meal’s namesake. So, for sure you’ll see Goofy here. You are likely to see other classic characters like Pluto, Donald Duck and the like. The Verdict? The highlight of this Disneyland character meal is a joyous parade of characters through the dining room. Then the characters split apart and make their way to the tables. Expect kid-friendly food like macaroni and cheese, pizza, and chicken plus some especially tempting desserts. Tips? This is the only Disneyland restaurant that offers a character dinner. If you want to dine with characters in the evening, book this one early! Read reviews of Goofy’s Kitchen on TripAdvisor. Where? Ariel’s Grotto in Disney’s California Adventure Resort (so you must have a Disney’s California Adventure entrance ticket to dine here). Meals Offered? Breakfast and lunch. 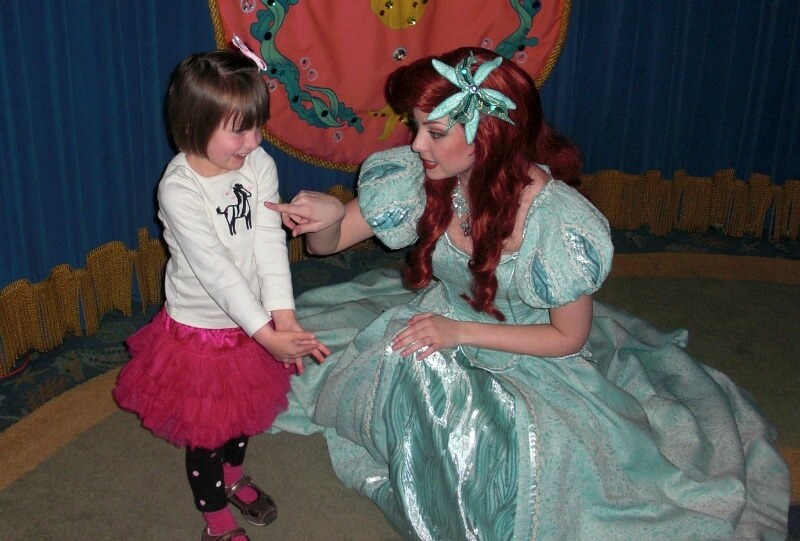 As of mid-June 2010, dinners at Ariel’s Grotto no longer feature princesses. Instead a special World of Color dining experience is available at night. The Verdict? For a Disney princess fan, this is the ultimate treat for a birthday or other celebration. Younger children scared of plush characters will find the princesses less intimidating. My son was just a toddler when we first tried this character meal and he seemed just as enthralled as his big sister by all of these sweet, beautiful women stopping by his table to say hello. Tips? There are both indoor and outdoor seating options at Ariel’s Grotto. Make your preference known when making a reservation and checking in. Read reviews of Ariel’s Grotto on TripAdvisor. Where? Disney’s PCH Grill at the Paradise Pier Hotel. Characters? Mickey Mouse and other classic Disney characters like Donald and Daisy Duck, Minnie Mouse, and Pluto as well as former title character, Stitch. The Verdict? This is the newest Disneyland character meal, headlining the head cheese himself, Mickey Mouse. 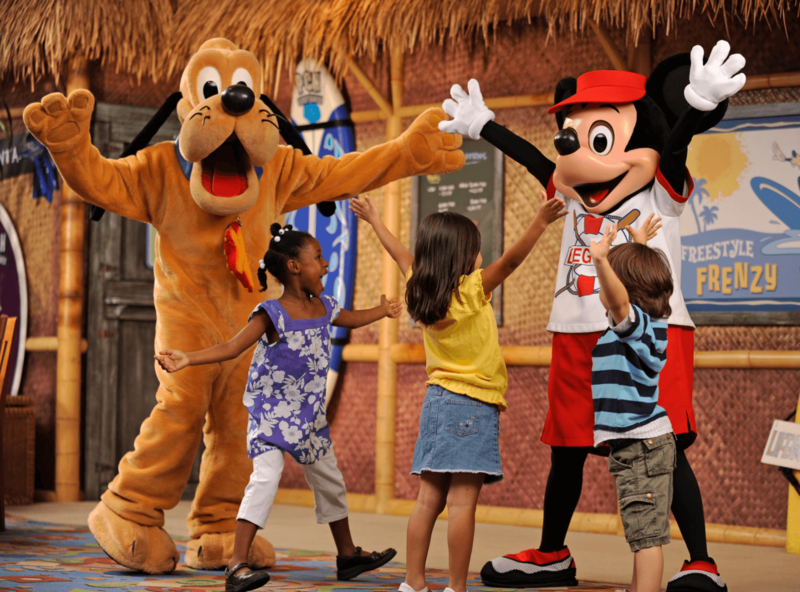 The characters dance, sing, and frolic with children throughout the beach-themed meal…so much that you might have a hard time getting kiddos to sit down and eat! Stitch was my kids’ favorite character to visit our table, stealing pretend sips of milk and causing other mischief in true Stitch-style. I highly recommend the longer walk to the Paradise Pier Hotel for this interactive and tasty meal. Watch a video of the Mickey Mouse & Friends character meal entertainment. Tips? I’ve never seen Mickey Mouse at any of the other Disneyland character meals. Therefore, if Mickey is on your must-see list, make your reservation at the PCH Grill. You may need to wait a long time after checking in to be seated at this popular meal so plan accordingly. Read reviews of Disney’s PCH Grill on TripAdvisor. Some young children are fearful of these life-sized cartoon characters. Before attending a character meal, you may want to get your child acquainted with Disney creatures by reading books featuring Disney characters, watching Mickey Mouse Playhouse or other shows on the Disney Channel, or renting a couple of Disney movies. Also, you may want to wait until after your family has had a day in the parks to get used to the idea of the characters at a distance before plunging into a character meal. 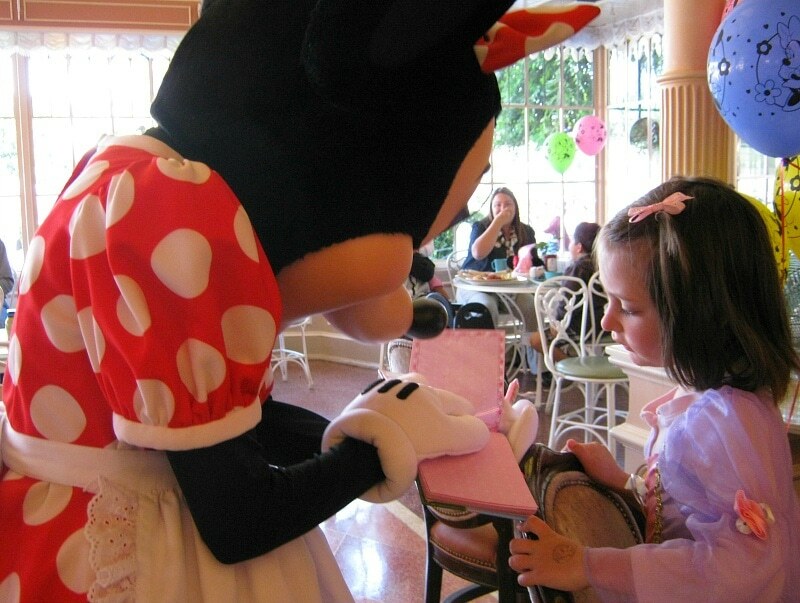 An autograph book brings a whole new, entertaining dimension to the character meal experience. Hold off purchasing one until your child is old enough to appreciate it. My daughter requested her first autograph book at age 5 and proudly brought it to preschool for “show & tell” the following week. 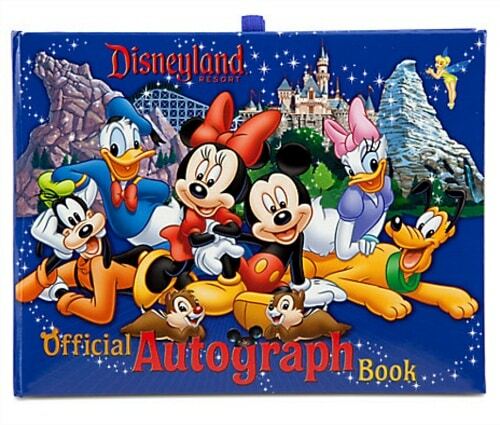 Buy your autograph book and Disney pens now from the Disney Store! Whatever you do, don’t forget your camera or smart phone! Shots of your kids cuddling up to their favorite Disney characters are priceless. Reservations are recommended for all of Disneyland character meals. Book as far as 60 days in advance here: (714) 781-3463. 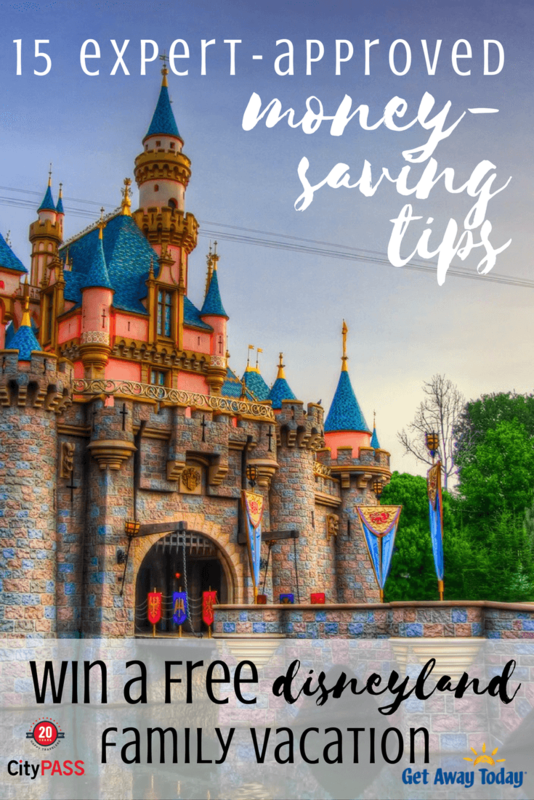 Want to save money on your Disneyland vacation? Of course you do! Use discount code TravelMamas to get an extra $10 off any two-night or longer Southern California package (hotel and two ticket minimum) when you book through Get Away Today. We partnered with our friends at Trekaroo to offer you a chance to win an awesome Disneyland vacation for a family of four. This giveaway has ended but you can still check out Trekaroo’s 15 Expert-Approved Money Saving Tips. What is your favorite Disneyland character meal? Leave a comment below! A Note from the Travel Mama: My family paid for all of the meals mentioned in this post ourselves. I will always let you know if I receive any complimentary or discounted goods or services related to a story on TravelMamas.com. Wow.. these are simply amazing. I hope one day I will be there. thanks for the contest!and the blog about disney! Thanks for the tips. Did I miss how much they cost? I do not include pricing in blog posts so that the information remains evergreen on TravelMamas.com, even though I do periodically update information in popular posts like this one. For Disneyland character meal pricing, visit: https://disneyland.disney.go.com/dining/#/character-dining Bon appetit! Hopefully we can take our kids one day. Yes! I hope you can too!! Our kids loved Surfs up Breakfast with Mickey. The only character meal, you can meet Mickey and Sitch! Stitch was hilarious ~ definitely a highlight of our Breakfast with Mickey! Thanks for the tips but I think we would rather be walking throughout the park rather than spending an hour at breakfast. Jan – I see what you mean. 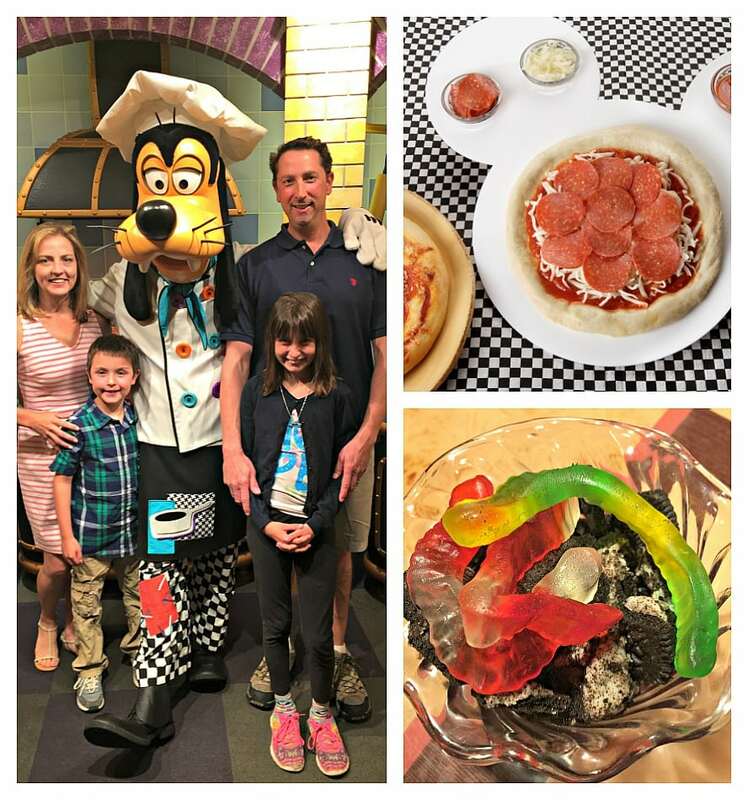 I typically plan a character meal on a day when we are NOT touring the parks – like on arrival day or departure day – to add an extra bit of magic to our visit. I have never been to a character meal but I know they book SUPER EARLY!! It was a good idea to do it on arrival or departure day. Thanks for the tips! kristiedonelson(at)gmail(dot)com Thank you. Happy Spring! Glad you like our tips, Kristie! I dont know my favorite meal as we are just planning on trying to take my daughter and nephew maybe next yr. thank you for awesome information. You’re welcome, Paula! Glad you found this post helpful! We loved our character dinning experienced at PCH. It was a must do because we wanted to meet Stitch. I totally understand why – Stitch is hilarious! You can see often see Remy (from Ratatouille) at the Cafe Orleans in the French Quarter and get a picture with everyone’s favorite “little chef”. So fun! I haven’t been to Cafe Orleans for a while. Will need to check it out the next time we go to Disneyland! Goofy’s Kitchen or Ariel’s Grotto would be the best for my family. I think we might have done Ariel’s Grotto at some point. You really can’t go wrong with any of the Disneyland character meal choices! We’ve never had a character meal — but Mickey always get my vote! I love all of the Disneyland character meals. Enjoy! I would say Goofy’s Kitchen for me but for the grandkids it would probably have to be Surf’s Up! Breakfast with Mickey & Friends they like most kids love Mickey Mouse! All are so fun – no matter which you choose! We are looking forward to Goofy’s Kitchen on the day of our arrival! Goofy’s Kitchen took really great care of all 4 generations when we were there! From the eldest to the youngest. So fun! I love visiting Disneyland with multiple generations! My kids would love Goofy’s Kitchen. Thanks for the tips. We are the Breakfast with Mickey Family! Have done that before and were not disappointed. Thanks for the tips! Any experience with allergies? Hannah – I am a gluten-free eater so I do have experience with working around food allergies and sensitivities at Disneyland. Disney is really fabulous about helping food allergy sufferers enjoy safe and delicious meals. When you make your booking, mention the allergy. Tell your server again when you arrive. Someone will walk you around and show you which items you can eat. They may even make a special meal just for you, depending on the severity of your allergy and dining situation. I have a friend whose daughter has Celiac and she never, ever lets her go out to eat anywhere for fear of cross contamination. I recommended a Disney Cruise to her because I know how fastidious Disney is about food allergies. They had a fabulous time on their cruise, with their daughter enjoying meals with the rest of the family with zero problems. You have to try them all at least once! For sure! Each one is fun for different reasons. The tips on where to eat are amazing but I bet it’s very overpriced for the meals. Best to pack snacks and eat at a restaurant outside the park. ???????????????????? Tony – It’s true that Disneyland character meals aren’t cheap. I think it’s nice for one splurge per trip. To save money on your character meal, be sure to take advantage of the Get Away Today discount! I also am a big fan of doing character meals in the earliest part of our vacation because I hate the line ups for autographs. The more we get this way, the less time we waste in the parks! My husband, on the other hand, doesn’t feel it is worth the extra money… fortunately he is a good sport and gives in for at least one a trip! 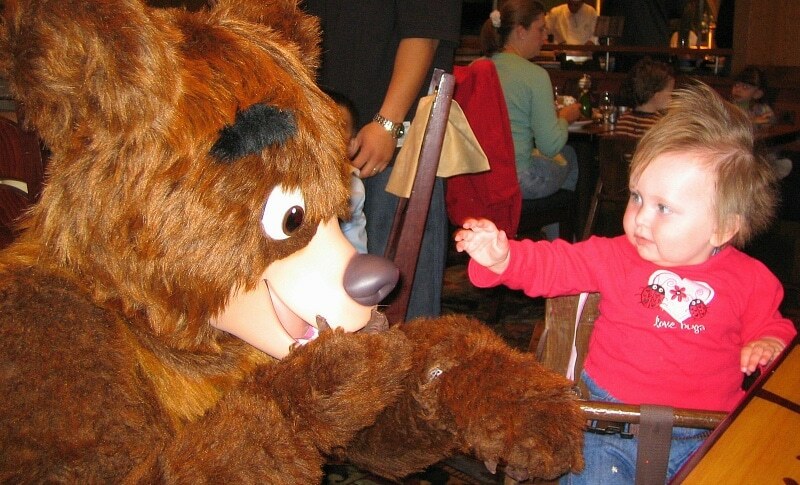 Home » FOOD & DRINKS » RESTAURANTS » Which Disneyland Character Meal Is Best for Your Family?